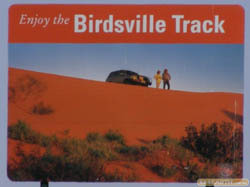 The Birdsville Track starts at Marree in South Australia where it leaves the Oodnadatta Track and heads for 525 km in a NNEast direction. It crosses over the border into Queensland for a short distance reaching Birdsville at the eastern edge of the Simpson Desert. It is an easy run that in dry weather can be driven by normal cars but the durable tyres of a 4wdrive vehicle are an advantage. Birdsville is the starting point for many great adventures in all four directions so many people find themselves here on many occasions, often to coincide with the annual Birdsville Races. The early exploration and history of this hostile environment is amazing so do some research beforehand in order to fully appreciate this iconic Aussie track. Two days or three days are sufficient for the journey. Bush camping is great at Clayton Wetlands with its hot artesian spa. Further on is a barren camp at Cooper Creek but I would suggest you push on to Mungerannie Roadhouse with its artificial wetland that attracts much birdlife. Hot showers, fuel and the pub make this stopover welcome even though you have to pay. The next days travel has some bad corrugations amongst sections of good track. Birdsville has good facilities including of course “the pub”, a large caravan park, museum and a calorific bakery. No trip to Birdsville would be complete without the buzz of 4wding the largest sand dune in the Simpson Desert. Big Red is 35 km west of Birdsville and is quite a challenge to a lot of people, most of whom don’t lower their tyre pressures sufficiently, if at all. If you do it late in the day you can experience a desert sunset as well.